67 Early Learning and Childcare Practitioners Achieve Qualifications! 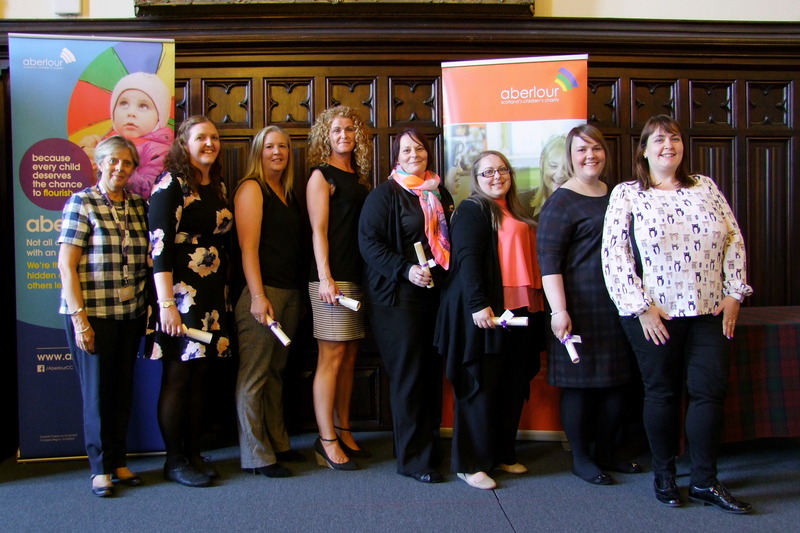 Aberlour Futures, an SQA Accredited Centre providing Vocational Qualifications and Training for the Early Learning and Childcare Workforce in Aberdeen City and Aberdeenshire has helped 67 Early Learning and Childcare practitioners and managers to achieve childcare qualifications. The successful practitioners included a group of Early Learning and Childcare managers who attended North East Scotland College to participate in the Professional Development Award in Childhood Practice, SCQF level 9. A group of young people also celebrated achieving their Modern Apprenticeship in Social Services Children and Young People Level 3 or Playwork. Employers have commented that the young people coming into the sector with Aberlour training are “prepared for the challenges of supporting our youngest children”. Aberlour Futures works with young people, people new to the sector and existing practitioners who have not yet undertaken their mandatory qualifications. Gaining qualifications whilst at work ensures that people currently employed can maintain their jobs and develop their careers. See our photo gallery from the night. Programmes are funded by Aberdeen City Council, Aberdeenshire Council and Skills Development Scotland. Find out more about achieving your qualifications.